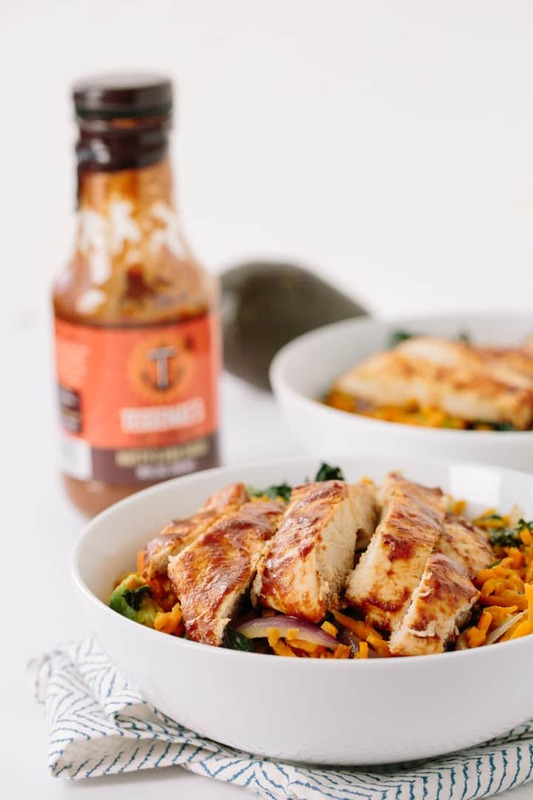 Not only am I sharing this delicious recipe, but Tessemae’s is giving away one of their Rainbow Packs, filled with 10 of their all-natural, Paleo and clean-eating friendly condiments, dressings and sauces! Yes, I used a bottled BBQ sauce for this recipe. Listen, sometimes you don’t have time to prep your own sauces. Lately, I’ve been working 14 hour days and have barely had time to brush my teeth in the mornings, so I have been taking shortcuts with my meals. Shortcuts don’t need to have a negative connotation, though! As long as you’re using the right products, you have nothing to worry about. My old boss said, “work smarter, not harder” and I’d like to say that sometimes, it’s okay to “eat smarter, not harder.” Okay, that doesn’t really make much sense, but you get my point! One day our brother Matt got fed up with all the junk in regular BBQ sauce, locked himself in a room and 30 days later came out with Matty’s BBQ sauce. You’re welcome America. The ingredients for this sauce are simple, you can find them here. I love that they use dates to sweeten the sauce. I typically like a spicier BBQ sauce, so if you do too, just add a few splashes of your favorite hot sauce into the cup of BBQ sauce (my favorite hot sauce is Tessemae’s, actually!) to add a kick – just be sure to stir it in! 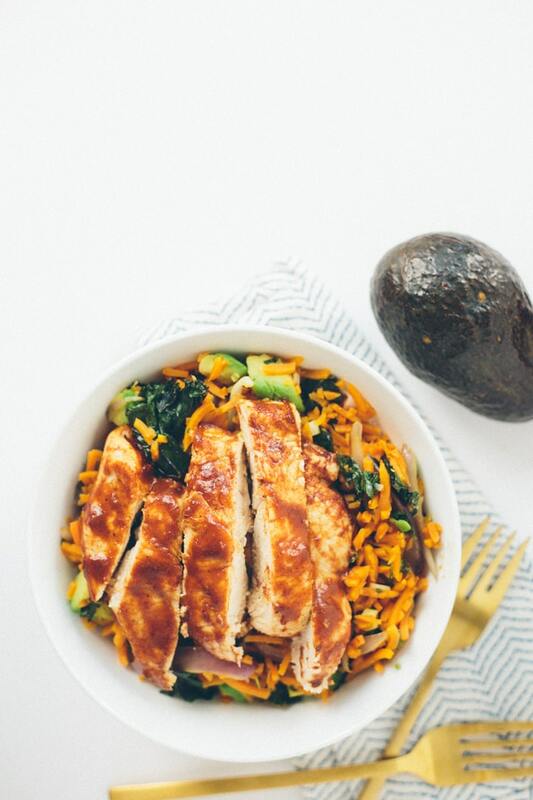 This BBQ chicken bowl has all kinds of flavors and textures – the sweet potato rice are slightly sweet, which pairs beautifully with the BBQ sauce. The kale, onions and avocado provide nutrients, healthy fats and dietary fiber to make this dish a comforting bowl of healthiness! See? Using bottled and jarred sauces is okay – just always read the ingredient list first. There are plenty of companies like Tessemae’s out there, working hard to create products that are for busy cooks like us who still want to eat healthfully. 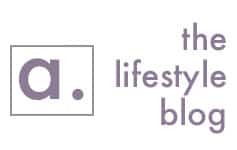 By the way, we’re fully functional on the blog now! You can make comments, finally! Thanks for your patience, and I’d really love to hear your feedback, so e-mail me anytime! Tessemae’s is offering one lucky reader their Rainbow Pack, which consists of 10 different varieties of their products, including: Lemon Garlic, Zesty Ranch, Balsamic, Lemon Chesapeake, Soy Ginger, French Vinaigrette, Southwest Ranch, BBQ, Cracked Pepper, Mild Hot Sauce. To enter, use the widget below! Goodluck, giveaway ends March 17 at 5pm EST. Open to US addresses only. Preheat the oven to 400 degrees. Drizzle half of the olive oil on a rimmed baking sheet and spread around with a brush to coat the surface of the pan, where the chicken will be placed. Place the chicken thighs (or breasts) skin down on the pan and roast for 25 minutes. Remove the pan from the oven and brush the BBQ sauce all over the tops of the chicken. Using a spatula, carefully flip the chicken (careful not to tear the skin) and then brush the sauce over the other side. Bake for 7 more minutes and then remove from the oven again, brush with more sauce and then bake another 7 minutes. 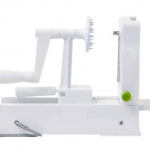 While the chicken cooks: peel and spiralize the sweet potato, using Blade C. Place the noodles into a food processor and pulse until rice-like and set aside. Then, cube the insides of the avocados. Then, thinly slice the onions. Then, mince the garlic. Then, chop the kale into at least 4 cups. Remove from the oven again, brush with more sauce and then increase the oven temperature to 425 degrees. Roast for another 5 minutes or until sauce beings to brown around the edges and chicken is cooked through (no longer pink on the inside.) Remove the chicken from the oven and let rest for 5 minutes and then slice into 1/2” strips. Once you remove the chicken for the final time, place a large skillet over medium heat and add in the rest of the olive oil. Once oil heats, add in the onions and let cook 2-3 minutes or until translucent. Then, add in the garlic and let cook for 30 seconds or until fragrant. Then, add in the sweet potato rice and broth. Let cook, stirring occasionally, for 2-3 minutes and then add in the kale, season with salt and pepper and cook another 5 minutes, or until kale is wilted and sweet potato rice is cooked and softened but not mushy (taste test occasionally.) Stir in the avocado and let cook for about 2 minutes or until heated through. 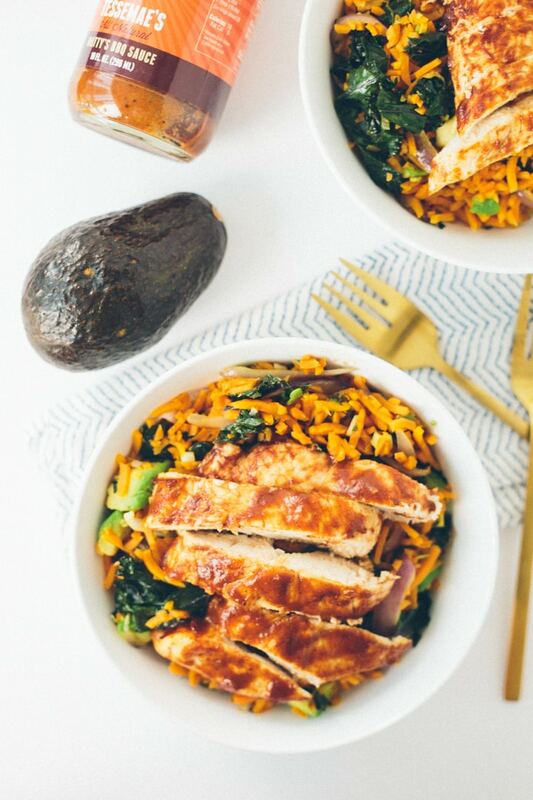 Divide the rice into bowls and top with BBQ chicken slices. Their balsamic is my absolutely favorite dressing of all time! Unfortunately, it's only for US addresses - I'm sorry! Yum! I would love to try the lemon garlic! These BBQ sauces look absolutely delicious! As a fellow Paleo lover I would absolutely be in heaven to get my hands on these sauces!!! Dying to try the southwest ranch! And excited to try this recipe as well! The zesty ranch or soy ginger sound yummy! 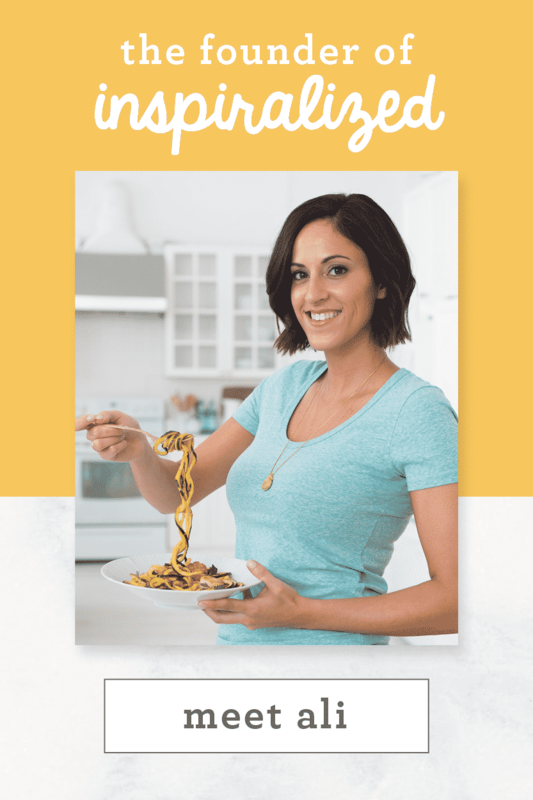 I love getting your recipe updates and incorporating them into my weekly menu! Thank you for doing the giveaway! I already know that their lemon Chesapeake dressing is the best thing to happen to my mouth, but I'm also really excited to try their BBQ sauce because I love that it's sweetened with fruit. If we don't use the barbeque sauce, the sugar content will drop dramatically - right? Too much sugar for me. Otherwise, the recipe looks great! Any other suggestions for a less-sugar recipe but great taste? The Soy Ginger and the Lemon Garlic would be delicious with some simple stir-fry, spiralized dishes--yum! 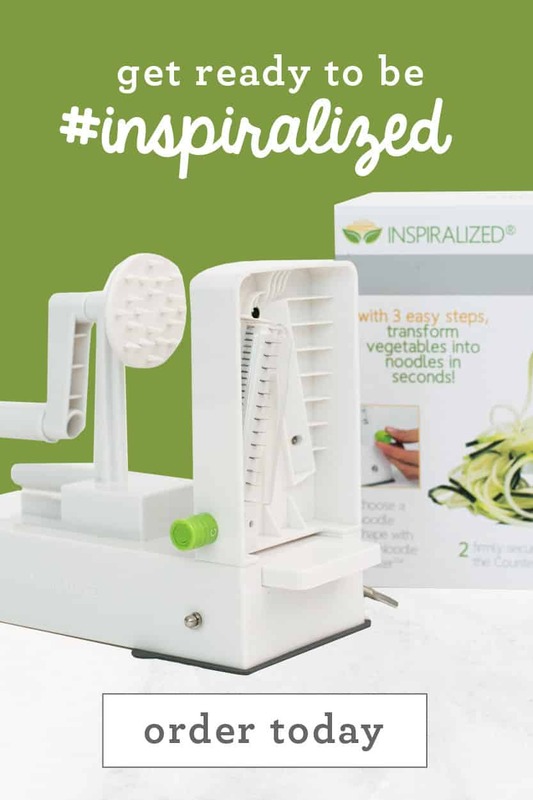 I'm new to spiralizing but I've fallen in love with zucchini noodles and cucumber noodles! I love all the Tessamae products. I am cooking my way through your cookbook. P. 130 last night was a big hit! The mild hot sauce sounds the best to me. I LOVE Tessemae- without them I would NOT have made it through my first Whole 30!!! I cannot wait to try this recipe, looks delish! I love ginger so the soy ginger sounds very appetizing to me. Well, let's face it...they ALL sound appetizing! Congrats on all your recent successes! I have one request: When you list the ingredients, could you do it by weight or volume, please? It can make a big difference in calories, and one person's medium can be another's small or large. It doesn't seem like it would take much extra time if you prep the amount for the recipe and then give it a quick weigh. In the above recipe,, "2 medium sweet potatoes" might become, "8 oz sweet potatoes, about 2 medium." Thanks! The sauces look wonderful.....would love to try them. I love Asian flavors, so the Soy Ginger would be at the top of my list to try. Thank you for telling us about this bbq sauce! It sounds amazing! I will can't wait to try this recipe! Dying to try bbq and honey mustard! I cant stop telling my friends about the ones I've tried so far. Love tessemaes! I had never heard of this company till I read this post, so thanks for sharing this. It seems like products I would love. I'd love to win. This recipe sounds delicious. Definitely need to make it! That hot sauce sounds awesome!! I would love to try the Southwest Ranch! Being from Memphis I am a total barbeque freak! It is so hard to find a healthy alternative to our local sauces but this one looks fantastic! I can't wait to try and be able to share with family and friends. THis post looks so yummy!! I am so glad you posted about these sauces. I have avoided store bought sauces in the past because of the long list of "stuff". I will be looking for these the next time I am grocery shopping. You're right - sometimes there is just not enough time to do it all. Thanks for the give away! I love their Buffalo sauce! Cannot get enough. The soy ginger looks delicious. Love Tessemae's! This recipe looks delish! Tessemae's Rainbow Pack--yummy! The Lemon Garlic sounds delish. I am going to make this recipe with sweet potato rice too! These sauces sound so good! All of them! But if I had to pick I would have to say the lemon Chesapeake sounds good. 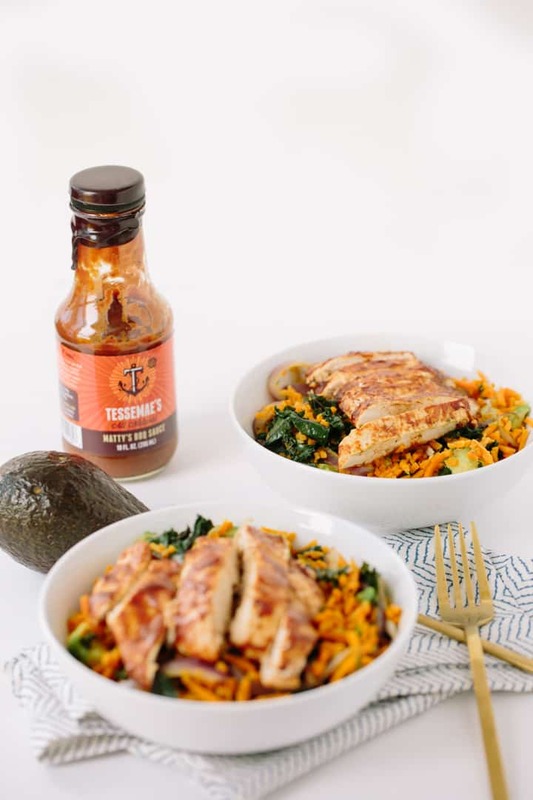 Never tried Tessemae's sauces but sounds (and looks delicious here)! I might make this for supper with some homemade BBQ sauce! Unfortunately not all their sauces are paleo - the soy ginger for example (can't have soy if you are doing paleo) but they all do look delicious. i have tried about 3-4 of their flavors that are sold in my grocery store, but i would love to try some of the flavors that aren't really sold nationwide! I am defintely going to purchase this stuff if I don't win it. I have a gift certificate to whole foods and I know they have it there. Thanks Ali for coming up with fantastic recipes for me to make for my husband and myself. Keep up the great work! You are always an inspiration. Thanks for the kind words, Lauren!! Yum! Soy ginger sounds amazing. Classic French! I can't have tomatoes, and their recipe is tomato-free. Another plus: No sugar. I love Green Goddess dressing, and can't wait to try their healthy version. Definitely want to try Matty's BBQ sauce, and Hot Buffalo Sauce... Seriously, they all sound great. I love their commitment to using healthy ingredients. Thanks for posting, Ali. Glad to hear you might have found a classic French that meets your dietary needs! I've been dying to try this BBQ!! I love all the Tessemae's products I've tried thus far! Oooh - I haven't tried these. Soy ginger would be on the top of the list. The Soy Ginger looks wonderful! I've never tried this sauces before so would love to try them out! I'm starting to incorporate salads into my everyday meals and need a variety of flavors to keep me eating them. I live in NYC and can't find Tessame's at Whole Foods, Fairway, etc. Where do you buy it? I can't wait to try the French Vinaigrette and the Lemon Chesapeake! This recipe looks so delish. On my "must cook" recipe list!! Def want to try Tessemae dressings! All of the sauce flavors look wonderful. There are so many possibilities. This recipe looks so delish. On my "must cook" recipe list!! 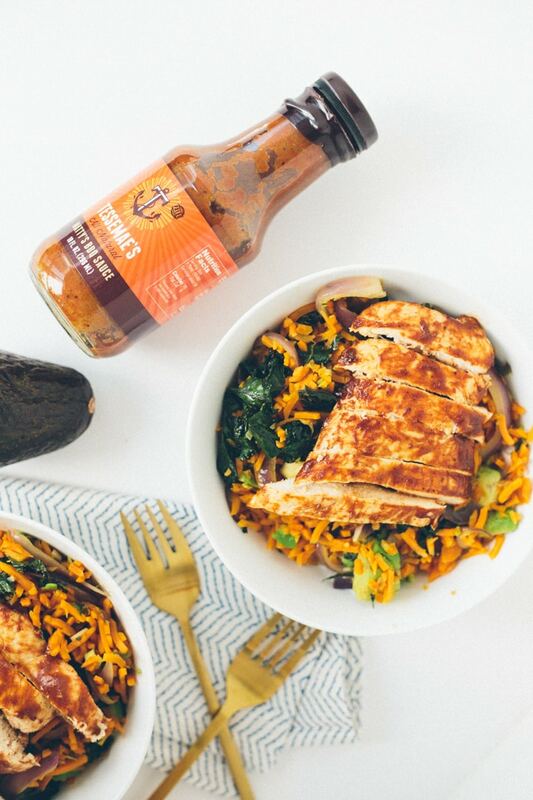 Def want to try Tessemae BBQ dressing! This looks amazing! I've never tried Tessemae's before, but it looks like I'm going to have to find it!! I would LOVE to try the green goddess. Mmmm... I want to try the BBQ and Zesty Ranch! The Lemon Garlic is right one track with my current cravings... I know my kids will be excited to try the BBQ and my husband will want the hot sauce! It's a pack for everyone!!! Lemon garlic! That's for me. I love paleo friendly condiments, sauces and dressings! Not easy to find- looking forward to trying these! I'd love to have a source for healthier sauces. Green Goddess sounds great. Ne to Paleo and I'd love to try these sauces. Shortcuts can definitely be positive. Love this idea for a quick but healthy meal! Can't wait to try the BBQ sauce, this recipe is making me hungry! Also the Black Pepper and Southwest Ranch sound right up my alley! Soy ginger please!! One of my most favorite flavor combinations! This looks so good! I can't wait to try it! I would also love to try that Mattys bbq sauce. I am a bbq sauce junkie. I eat it on everything! The Green Goddess sauce sounds yummy! Would love to try them all though! I've always wanted to try Tessemae's! This might be the push to just go out and buy it, it's at Whole Foods, right? Also - these are like all of my favorite foods. Have yet to spiralize a sweet potato but I've got some hanging around my kitchen :) Thanks for all the awesome recipes, Ali! I'm really excited to try them all - but mostly the BBQ!! I'll be heading to Whole Foods tomorrow to pick some up now that I know they have it here in Iowa! 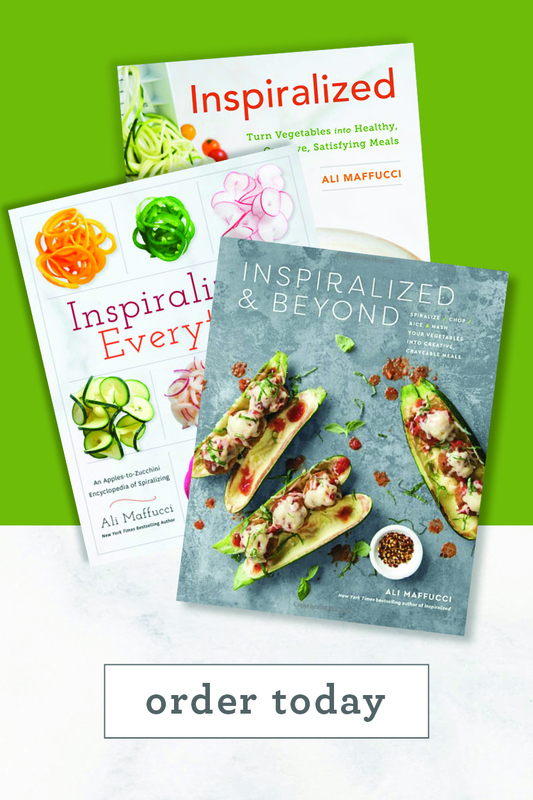 I can't wait to start my clean eating spiralized journey! I've tried some of the dressings. Very impressive and tasty to boot! I will look for this bbq sauce. This recipe looks to die for! Love Tessemae's! Hope I win! Alll of them look great! Love the clean ingredients. This looks delicious, adding it to the recipe box. And I would love a bunch of free Tessemae's, love everything I've ever had from them. Those look great! Can't wait to try them!!! All of the condiments look delicious, but I think I would try the Southwest Ranch first, followed by the BBQ!!! These sound yummy and would provide endless play potential when paired with spiralized foods! The soy ginger sounds really good! Oh Yum! I'm always looking for new ways to make kale, can't wait to try this recipe. 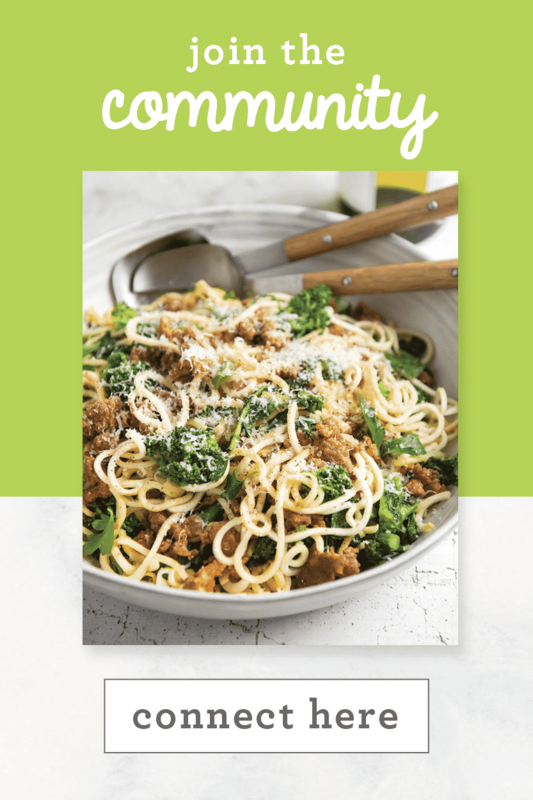 I'm always looking for new ways to try and make kale tasty; I can't wait to try this! I'd love to try the ranch. Regular ranch is so full of junk! Lemon Garlic and Soy Ginger sound amazing! I'm going to have to go with soy ginger - I've recently starting buying fresh ginger (instead of powdered) and it's made a WORLD of a difference. I love the ginger flavor and bet that sauce is delicious. I rarely ever use powdered - always use fresh ginger!! All of the flavors sound amazing! Speaking of sauces, you should make a category for just your sauces and dressings. I have used several of them for things other than the recipe they were created for and have to remember the salad or print it out. We really love your Creamy Balsamic dressing. Thanks for all you do! Wow, what a GREAT suggestion! I'm going to have our Brand Community Manager, Meaghan, work on this! I am IN LOVE with their zesty ranch and southwest ranch. Love all your recipes! I need some Tessemae's in my life! I can't find it anywhere in this one horse midwestern town. I often make my own BBQ sauce but these condiments look yummy! I'd love to try the cracked pepper, and my husband would love the soy ginger. I usually try to make my own sauces, but these look like a good, quick option! Also, this recipe was just added to my meal plan for next week. Looking forward to it! Definitely the soy ginger! I love healthy Asian-inspired sauces! I would LOVE to try these amazing sauces to spice up my dishes! And I'm always looking for a good all-natural BBQ sauce (especially to make this recipe). It is so wonderful that the company comes up with this all natural alternative for BBQ sauce. 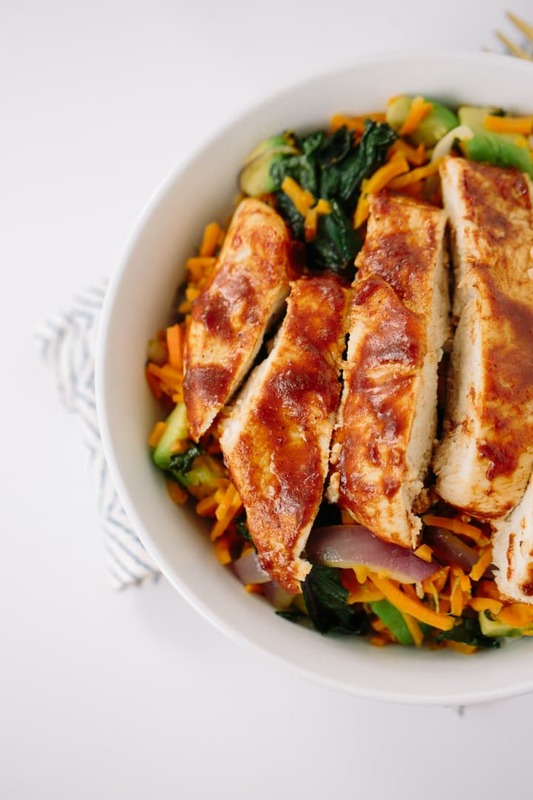 I really love the idea of BBQ chicken paired with sweet potato! The smokey flavor of BBQ should be a great complement to the subtle sweetness of sweet potatoes. Thank you for this recipe. The Soy Ginger looks really good! I am really interested in the BBQ sauce, but the dressings sound intriguing, too. Which other Tessemae sauces are your favorites? I'm not a huge fan of barbecue so I'd love to try some others. this sounds super tasty! 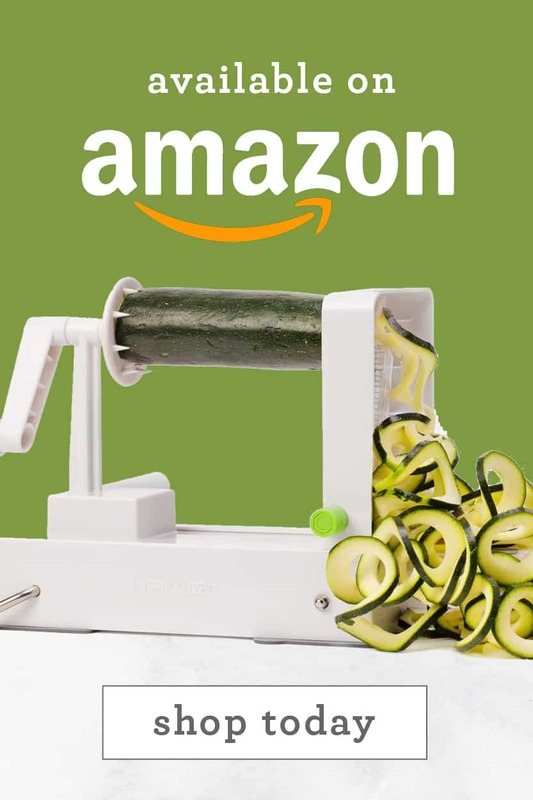 It's definitely going on the menu soon as my friend just sent me a spiralizer and now it's game on! The Lemon Chesapeake sounds really intriguing, thanks for bringing a company like this to my attention! I always put jarred sauces back, even though they are tempting, cause I don't like the stuff on the ingredient list. It's awesome that more people are starting to put things out there that are tasty and full of good stuff for when making stuff from scratch just can't happen. I am always looking for a new hot sauce to check out, and the Lemon Chesapeake sounds delish too! Definitely most interested in trying the zesty ranch and the lemon chesapeake!! Love soy ginger and BBQ! soy ginger would be great with stir fry! I can't wait to try the BBQ! I didn't realize they made it!! I've been loving the Lemon Garlic dressing on my salads! Anxiously waiting to open up the cabin here "up north" and start grilling! These would be awesome! They all sound delish and healthy. Especially want to try the barbecue and soy ginger sauces. I can't wait to try them all, but especially the soy ginger! they all look good, especially the BBQ! Tessemae’s has become one of my favorite brands. I've used the Lemon Chesapeake on shrimp a few times and it was delicious! I can't wait to try the BBQ - I don't think my local grocery store carries it (that I've seen) but I'll ask for it... or order online! I love the Lemon Garlic, but I'd really like to try the Soy Ginger! I am looking forward to trying the ranch....also the lemon!! The Lemon Garlic and the Soy Ginger look delicious! Love that the Soy Ginger is still gluten free! Looks absolutely delicious, and the possibilities are endless. The cracked pepper sounds amazing! All of these sauces sound insanely delicious! The soy ginger would be great on salmon. Crossing my fingers that this rainbow pack will be mine! I'd love to try them all, but top of my list would be the Soy Ginger and Mild Hot Sauce - yum! I've been wanting to try Tessemae's! Thanks for the great recipe and chance to win. This looks outstanding! 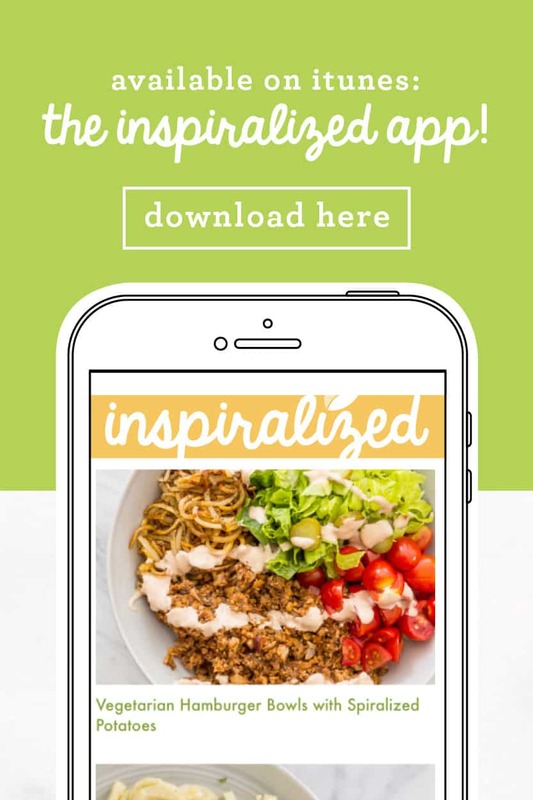 Ready to move toward grain-free dining, and the recipes on Inspiralized show me that I can do it! These dressings look amazing!! This dish looks delicious! I've tried some of Tessamae's dressings before for my salad's and absolutely love them! I would love to try all of them but especially the BBQ. Have had a hard time making bbq sauce myself! I am most interested in the Southwest Ranch variety. I love making my own sauces as much as possible but sometimes there just isn't enough time in the day to make everything yourself. I haven't tried their sauces yet but they sound delicious so I'll grab a bottle the next time I'm at the store. I love that they are date sweetened! Soy ginger sounds sounds delish! Thanks for the giveaway!! I'd love to share the BBQ with my hubby! He's a major BBQ fanatic, and his name is Matty! This would totally make me wife of the year! I would like to try the Buffalo flavor. This was so delicious! I've never had sweet potato rice but it's my new favorite thing! I also substituted kale for spinach since that's what I had on hand, and really enjoyed it. Ali, you did it again! Your recipes are wonderful and always a hit in my house. Loved spiralizing sweet potatoes for something different. The flavor combination was divine, and so colorful, but above all it's probably not something I would have tried before so thank you. Yum!